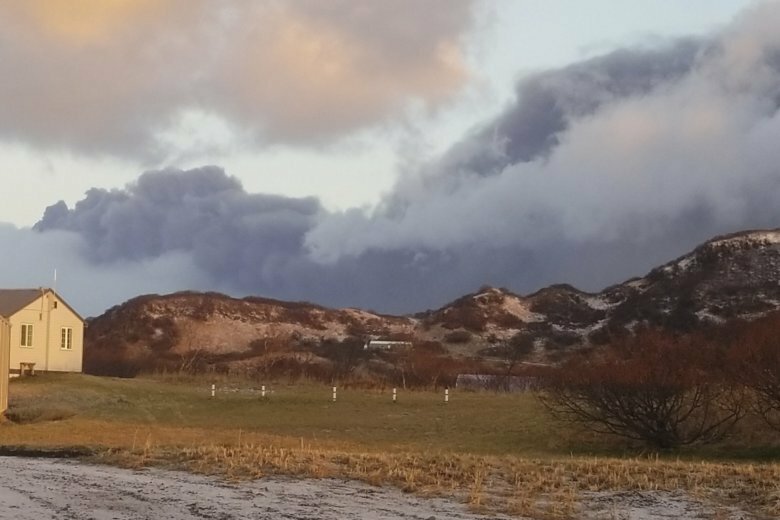 ANCHORAGE, Alaska (AP) — Residents of a tiny Alaska Native community woke up to a little pre-Thanksgiving excitement Wednesday, with a neighboring volcano spewing a billowing dark cloud high into the air. The sooty emissions from Mount Veniaminof were visible from the Aleut village of Perryville nearly 25 miles (40 kilometers) to the south, locals said. But the wind was pushing the plume away from the community of 101 people. “It’s a big, black, ugly cloud,” lifelong resident Victoria Tague said of the ash, which later slipped behind a cloud cover. Alaska Volcano Observatory scientists said that overnight emissions from Veniaminof generated an ash plume up to 15,000 feet (4,572 meters). The cloud drifted more than 150 miles (241 kilometers) to the southeast. The ash emissions prompted an aviation warning. Observatory geophysicist Dave Schneider said that level of emissions would affect mostly smaller aircraft. Ash above 20,000 feet (6,100 meters) could threaten jet airplanes. Veniaminof is 480 miles (772 kilometers) southwest of Anchorage on the Alaska Peninsula. It became active again in early September. About a month ago, Perryville was dusted by drifting ash. When people saw Wednesday’s distant ash cloud from the volcano, they were “a little alarmed,” said Gerald Kosbruk, president of community’s the tribal government. “This is the most ash I’ve seen come out of it,” he said. People also heard rumbling noises coming from the volcano overnight, he said. Kosbruk and others got on the VHF radio and recommended locals get face masks ready and stock up on water in case the wind shifts direction. Veniaminof didn’t keep people from holiday preparations, however. Around noon, people began heading toward the village school, where a community Thanksgiving potluck was being held, Kosbruk said. Perryville residents are used to living near a volcano. The village itself was founded in 1912 as a refuge for Alutiiq people displaced by the eruption of another volcano.